It’s day 35 of President Trump’s government shutdown with no end in sight. And it’s only getting worse. The latest: flights at New York’s LaGuardia airport, New Jersey’s Newark airport, and Philadelphia International Airport have been delayed due to staffing issues at air traffic control centers, according to the FAA’s website. NBC New York reports the FAA has ordered a ground stop at LaGuardia. “We have experienced a slight increase in sick leave at two facilities. We’ve mitigated the impact by augmenting staffing, rerouting traffic, and increasing spacing between aircraft when needed,” an FAA spokesperson told Gizmodo over email. Flights at Chicago’s O’Hare Airport, Orlando Airport, Miami International Airport, and Hartsfield–Jackson Atlanta International Airport appear to be experiencing delays as well, according to the FAA’s website. The unions representing TSA agents and air traffic controllers issued statements on Wednesday warning that the public is at risk since so many people aren’t getting paid. Many simply can’t afford to work at a job where they’re not getting paid, which seems completely reasonable. 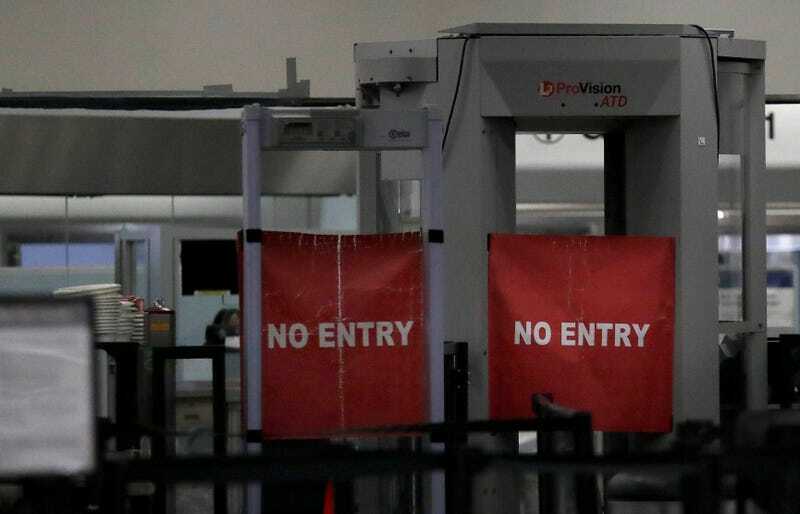 TSA agents are starting to quit, and some have reportedly started sleeping in their cars because they can’t afford the gas to get to and from work. “I’ve heard of these examples of the federal workforce, screeners in particular on the Big Island living in their cars,” American Federation of Government Employees Chief Union Steward Joshua Christie told Hawaii News Now yesterday. But these people should take some advice from President Trump’s Commerce Secretary Wilbur Ross. Appearing on CNBC yesterday he said that he couldn’t understand why federal workers are going to food banks. They should just be taking out loans, according to Ross. This is a developing story and we’ll update with more information as we have it.